As always I really enjoyed the week in St. Andrews for the Dunhill Links Championship. I finished in a tie for 7th, which helps to make it enjoyable, but it’s not the only reason. This is one of our best tournaments of the year and every year we come back it gets even better. After a long week in France at the Ryder Cup where my focus was on the team, it was a little strange to get back to playing and doing things for myself. Having spent the week watching the lads play I was itching to get back to it myself. Also it was nice to come to a tournament that I have had great success in over the years. During the course of the week I played some lovely golf and then some average stuff. On Thursday in the strong winds I played really well. I was in Kingsbarns for the first round, which was probably the best place to be as the course is quite playable in the wind. That said the scoring wasn?t great, but yet, I felt that I left a few shots behind me. I missed from less than 2 feet on one hole when I went to tap it in and somehow missed it and also three putted the 9th for a par. Still my three under was a good solid round. Then on Friday in Carnoustie, on about as easy a day as we will get around there, I was very ropey. I was up and down all day, making birdies and bogeys. The best I got to was one under at any stage, but in the end I shot level par. It was disappointing as the course was very playable but considering how I played, I felt it was a good score. I could so easily have shot a couple over par and have blown myself out of the tournament. On the weekend I played St. Andrews both days. The funny thing about my round on Saturday was that I missed a lot of chances and still shot three under. I made an eagle and two birdies but I felt that the course played easy and so thought I was going backwards. However it didn’t really work out that way. I finished the day in 19th position which was a lot better than I expected. On Sunday we started early with a shotgun start as the forecast was for high winds in the afternoon. It was a great idea by the tour as it meant that there was no risk to not finishing the tournament. The morning was bitterly cold and it got pretty windy early on. I started on the 15th which, as it turned out, was a good draw. I started out very ropey, making a great par on the 15th and then another one on the 16th. I could so easily have bogeyed both but the pars steadied me and from there on I played very nicely. On a tough day I managed to keep a bogey off my card and make three birdies. Like every golfer I would have liked to make one more birdie, however I made three good par saving putts on my last three holes so I can’t complain. I finished on 9 under par for the week and a share of 7th place. I was never in contention for the tournament but it was still a very good week. Looking back on the week I definitely left a number of shots behind me. I grazed the hole so many times it was hard to believe, however I am happy with my performance. I played some really good stuff during the week and the times I was off, I managed to hang in there and keep myself going. Unfortunately JP and myself missed the cut in the team event. We just never quite got going in and were left with too much to do on Saturday to make it to Sunday. However, as always, we had a great time. It’s on to Walton Heath for the British Masters now. I’m looking forward to playing as I can see that my game is trending the right direction. Padraig shoots a very pleasing final round of three under par 69 to finish in a tie for 7th at the Alfred Dunhill Links Championship. It is another good finish in a recent run of good form over the last few weeks in Europe. He had a very solid day with three birdies recorded and no dropped shots on a blustery day at the links! Onwards and upwards! A third round of three under par for Padraig at the home of golf, St. Andrews. He recorded only one bogey for the day on the par four 9th hole and also an eagle on the par-five 5th hole. Two birdies on the back nine including one at the last left him at six under par and still in with a chance of a top ten finish. Fourteen under par leads going into the final day which will be a shotgun start as bad weather is forecast for the afternoon. In the team event, he failed to qualify with playing partner JP McManus! Level par round of 72 at Carnoustie for Padraig as he records four birdies and four bogies. He got off to an unusual start as he made no par till the 5th hole, starting with two birdies and two bogies. He finished the nine with a birdie three but gave it back at the par three 13th before swapping one more birdie and bogey to sign for level par!. He tees off tomorrow at 9.33am at the home of golf, St. Andrews and is currently lying in tied 23rd place at three under par. Nine under par leads at the moment! In the team event, himself and partner, JP McManus are in tied 59th place so will need a good round Saturday to progress to Sunday! Pleasing opening round of three under par 69 at a windswept Kingsbarns leaves Padraig just one off the lead going into Friday and a trip to the scene of his Open Championship win in 2007 at Carnoustie. He played extremely well in the crosswinds and could have been even better as he missed from a foot on the 16th and three-putted the last! But overall, he will be well pleased as his iron shots were immense all day and gave him plenty of chances. He tees off in the second round at 10.06am local time! 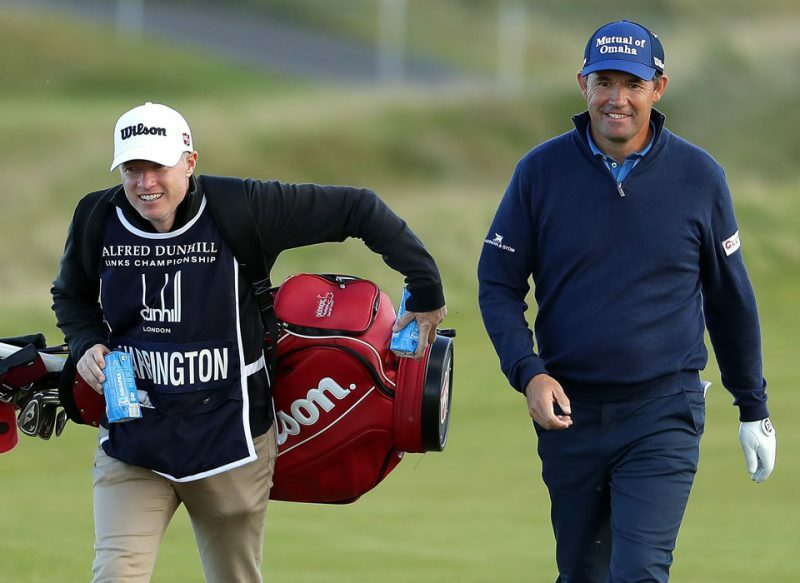 Padraig is in action this week on the European Tour where he tees off at 10.50am local time with Brandon Stone at Kingsbarns for the Alfred Dunhill Links Championship. It is played, as usual, over three courses, St. Andrews, Kingsbarns and Carnoustie. In the pro-am event, he is reunited with longtime partner, JP McManus, and are former winners of both major pro-am events, the Dunhill Links and Pebble Beach Pro-am’s! It is a fun packed week and will be a nice retreat after the pressure of the Ryder Cup! After a great week in Paris at the Ryder Cup watching and stressing over other people’s golf, I’m now in St. Andrews for the Dunhill Links Championship, which is one of my favourite weeks of the year. I’ve been coming here ever since I turned professional, originally in the old team event and then in its current format. As far as I can remember I haven’t missed a year since I have been eligible to play. Everything about this week is great; the courses, the company and most importantly of all, the craic. In fact the only problem with this week is that there is a tournament going on and we have to keep things serious. I’m coming into this week after not playing golf for 11 days and 9 of those days I didn’t even hit a shot. When I got out on the course on Wednesday in Kingsbarns I have to admit it felt weird. Nine days without hitting a shot is a long time for me! I went home for a couple of days after the Ryder cup, so have only had one practice round this week. I played Kingsbarns with Shane, Dunners and our latest professional, Rob Dawson. We played a little match and the old guys managed to knick the money. It was great craic and nicely competitive, exactly what I needed. I played a little ropey, which I wasn’t surprised by, but there were enough good shots for me not to be worrying. I’m partnering with J.P. as always and look forward to playing with him all year. We have won it a couple of times, the last one in 2006. I really like the format, as the team element helps take my mind off my own game. We are starting in Kingsbarns on Thursday at 10.50am with Brandon Stone. The forecast is for strong winds so, it will be a case of grinding it out. I’m looking forward to getting going, especially after watching so much golf the last week.